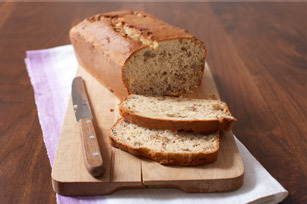 Don't let those old bananas go to waste - bake a luscious, nutty banana bread in four easy steps. 1. HEAT oven to 350ºF. Beat butter and sugar in large bowl with mixer until well blended. 2. ADD bananas, sour cream and eggs; mix well. Add combined dry ingredients; stir just until moistened. Stir in nuts. 3. POUR into greased and floured 9x5-inch loaf pan. 4. BAKE 1 hour or until toothpick inserted in center comes out clean. Cool 5 min. ; remove from pan to wire rack. Cool completely. Keep refrigerated.